Heavy gauge, enameled, aluminum signs with durable vinyl lettering provide permanent outdoor building, parking, no trespassing, retail store, traffic, etc. signs. Available in a variety of sizes, these signs are great for displaying directions or other important information. The larger sizes are suitable for inexpensive retail store or shop signs. Note: Mounting post not included. Lightweight PVC signs are as long lasting as the aluminum. Same +6yr outdoor rated graphics. 1/8 or 1/4 inch thick PVC plastic, extra glossy acrylics on request (additional cost). 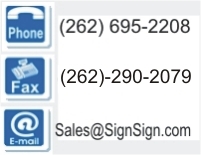 Email sales@signsign.com for non-standard size or materials pricing. Provide us with a description or file of what you need.